Longan is the round edible fruit of a tropical tree belonging to the same soapberry flowering plant family as the lychee, rambutan, maple, and horse chestnut. Within its thin brown shell lies a layer of semi-translucent white flesh that surrounds an inner shiny black pit. Because the longan fruit is round and looks like a dragon eyeball (the black seed shows through the translucent flesh like a pupil inside the iris), its name in Chinese – 龍眼 (lóng yǎn) – literally translates to “Dragon Eye”. The longan fruit is succulent, juicy, and very sweet with a light floral scent. It can be eaten raw like a lychee or rambutan fruit. Longan are also often de-shelled, pitted, and then dried for later use in cooking. When dried, the longan meat turns into a light brown (see bottom right on photo above). Its color darkens when it gets old. Fresh or dried, longan meat can be used in East Asian soups, snacks, and desserts. According to a food nutrition database from the USDA, the longan fruit is a good source of riboflavin, potassium and copper, and a very good source of Vitamin C.
The longan fruit is also very low in calories, making it a great fruit snack for those concerned with body weight. One fruit (3g) contains only 2 Calories. From a Chinese Food Therapy and medicine perspective, longan is used to relieve insomnia, forgetfulness and anxiety associated with blood and qi deficiency. It is classified as a food with warm properties. Eating too many longan can hence cause internal heat. To eat the longan fresh as a fruit, squeeze the top with both hands between the thumb and the index finger (like “cracking” a sunflower seed) to crack the shell open at the top. 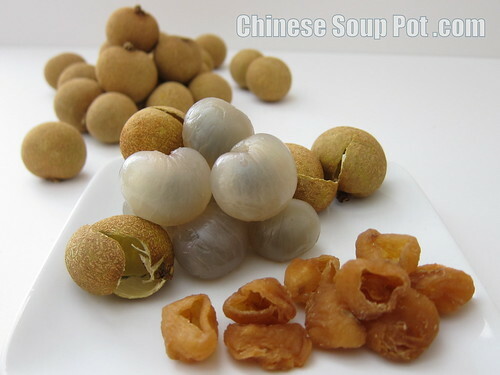 To use fresh longan in cooking, de-shell each fruit using the method described above, ripe the flesh in half with your fingers and remove the shiny black pit inside. To use dried longan in cooking, rinse the dried fruit briefly under cold water before cooking. Soaking is not needed in most cases – especially if your cooking time is 30 minutes or more. Fresh longan can be found in Asian supermarkets. They are usually sold in the fruits and produce sections in red or white plastic fish net bags (see small photo above). Choose ones that are firm when you gently squeeze them. Fresh longan also come conveniently de-shelled, pitted or un-pitted, and canned in a watery syrup. These can be found in Asian supermarkets or online. Some big-scale Western supermarkets in large cities will carry canned longans as well. 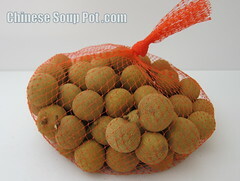 Dried longan can be found in Chinese herbal stores, some Asian supermarkets, and online. How do you use your Longan? Leave a comment below to share your ideas. I’ve never had logan until I came to the States (and more Chinese food around me). I really like eating these but I didn’t know the benefit this fruits have. Really interesting and now I want to have some! What an informative post! I’ve never heard of longan until now, but I’d love to try it! I’ve heard of these before, but I had no idea what they were. When I saw the picture, I figured that they were lychees! I’m going to look for these the next time I go to the local Asian market now that I know what to do with them from your post.